Critically acclaimed vocalist Somi is set to launch Baryshnikov Arts Center’s (BAC) 2016 Fall season with a performance on Tuesday, September 27 at BAC’s Jerome Robbins Theater in New York, NY. Joining Somi will be guitarist Nir Felder, pianist Toru Dodo, bassist Ben Williams, and drummer Nate Smith. Somi, who is often referred to as a modern day Miriam Makeba and who was recently hailed by the Huffington Post as “the new Nina Simone,” blends jazz and world music into a new art form that is as unique as it is inspiring. She will perform a program of songs from her repertoire–both old and new–and will also be the featured performance of BAC’s annual Fall Fête on Monday, September 26. The performance marks a return to BAC for the songstress, following the BAC Space creative residency she received in Fall 2015 to develop Dreaming Zenzile, a jazz opera inspired by the late South African singer and political activist, Miriam Makeba. The residency came after Somi garnered critical acclaim for her chart-topping 2014 album The Lagos Music Salon (Sony/OKeh), which was inspired by an 18-month sabbatical in Lagos, Nigeria and featured special guests Angelique Kidjo, Common and Ambrose Akinmusire. 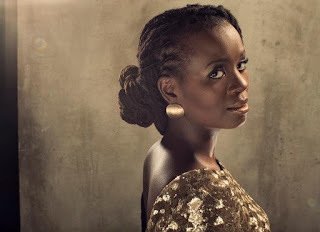 Born in Illinois to immigrants from Uganda and Rwanda, the African and jazz legacies are always crucial to her sound. As a TED Senior Fellow and also founder of the New Africa Live, a nonprofit dedicated to celebrating the best contemporary African Artists working in performance, visual and literary arts, Somi has for the last decade carved out a career of singing and being an activist. She has also been honored for her activism and connection to African art, being invited to perform at the United Nations by Secretary General Ban-Ki Moon, invited to perform at Carnegie Hall (alongside her longtime mentor Hugh Masekela as well as Dave Matthews and Vusi Mahlesela in celebration of 20 years of South African democracy), and a headline performance at the National Museum of African Art’s (Smithsonian Institution) 50th Anniversary Gala, among others.